Manolo Gabbiadini’s double rescued Southampton as his side twice came from behind to salvage a 2-2 Premier League draw against Newcastle. 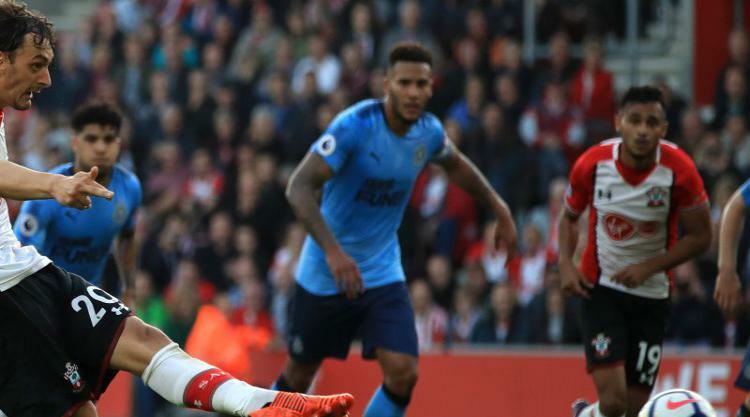 Saints looked to be staring down the barrel of a third straight league defeat when Isaac Hayden and Ayoze Perez put Newcastle ahead in each half at St Mary’s Stadium. But both times Gabbiadini hit back, his second goal coming from the penalty spot after Newcastle’s Florian Lejeune had brought down Shane Long. Gabbiadini was making his first start in more than a month and Mauricio Pellegrino will hope his brace prompts a return to the sort of form that saw the Italian score six goals in his first four games for Southampton last season. He had previously only managed one so far this term. The striker’s intervention here will also come as a relief to England hopeful Fraser Forster after the goalkeeper endured several shaky moments and was caught out of position for both Newcastle’s goals. For Rafael Benitez’s side, who stay ninth, this was an opportunity missed against a team struggling for goals and confidence but the game might have been very different had DeAndre Yedlin been handed a second yellow card for a late challenge early in the second period. Dusan Tadic should have put Southampton in front but nodded Nathan Redmond’s cross over when left free at the back post and it proved a costly miss because in the 20th minute, the visitors took the lead. Christian Atsu’s driven effort was blocked by Maya Yoshida, but with Forster already diving to his left, Hayden’s first-time shot wrong-footed the goalkeeper and hit the back of the net. Southampton lost their way and when a free-kick routine resulted in Redmond side-footing straight to his opponent’s feet, the home crowd let out a collective groan of irritation. Newcastle almost doubled their advantage early in the second half when Perez’s feathered finish dropped onto the bar before two goals arrived, one at each end, in as many minutes. First, Gabbiadini whipped a shot through the legs of Javier Manquillo and into the bottom corner before Perez restored the Magpies’ lead, reacting fastest to Forster saving his initial shot by squeezing in the rebound from the angle. Newcastle were back in the driving seat but fortunate not to play the last half an hour with 10 men as Yedlin, already booked, flew in high and late on Redmond. Referee Kevin Friend judged a final warning punishment enough. There was no doubt about the penalty decision with 15 minutes left, however, as Lejeune needlessly fouled Long when the striker was posing little threat to Newcastle’s goal. Gabbiadini slammed the spot-kick home to level up. Both teams pushed forward in search of a late winner and Lejeune almost made amends for his earlier error, only for substitute Steven Davis to clear the Frenchman’s 89th-minute header off the line.